— The Pentagon is looking at options, but there are no plans for U.S. forces to go ashore in pursuit of pirates in Somalia, a spokesman for the Joint Chiefs of Staff said Friday. Adm. Mike Mullen, the chairman of the U.S. Joint Chiefs of Staff, recently asked the military to look at “what options and alternatives are available from a purely military perspective” to deal with piracy off the coast of Somalia, Capt. John Kirby told CNN. Pentagon officials are shying away from a direct endorsement of a proposal the United States is circulating at the U.N. Security Council that calls for countries to “take all necessary measures ashore in Somalia, including in its airspace,” to counter piracy. 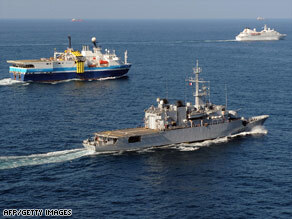 Above: A French frigate, center, escorts ships off the coast of Djibouti to protect them from piracy last month. However, Kirby said the Pentagon is not doing any planning to launch attacks against pirates on land or in the air. “We are not looking at how to implement the resolution,” Kirby said. The developments come after Somali pirates released a Greek chemical tanker they have held since October, a piracy monitor said Saturday. Circumstances of the release were not immediately known. You are currently browsing the archives for the military options category.